Sony KDL-40CX523 review | What Hi-Fi? While some screens betray their bargain price by having some specification oddities, Sony’s KDL-40CX523 goes a different route. This CX523 has an absolute stack of specification highlights when you consider the price. It’s a Full HD, 1920 x 1080 panel, is ready to join your wireless network with the (extra cost) addition of a wireless dongle and is a firmware-upgrade away from being Skype-enabled. All of Sony’s exemplary Bravia TV internet functionality is on board (BBC iPlayer, LoveFilm and so on joined by Sony’s excellent Qriocity cloud-based services), as is Freeview HD and USB recording, and there’s even a remote control app for smartphones of any brand. On paper, the CX523 is tempting in the extreme – and its lack of 3D functionality is no great surprise at this kind of money. In the flesh (or rather in the thin, creaky plastic), though, this Sony set has some limitations. 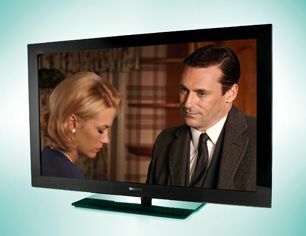 Firstly, its rather old-school appearance – it may seem churlish to criticise a TV for being the best part of eight cm deep, but the Sony’s use of CCFL backlighting rather than the more modish LED makes for a chassis depth that has more than a hint of 2007 about it. And when it’s a chassis made, seemingly, from credit card-grade plastic, the sense that you’re buying into yesterday’s technology is all the stronger. The impression that time has rather passed the CX523 by is reinforced by the caprices of its backlighting – in dark scenes (or in any 21:9 film with top and bottom letterboxing), our screen’s backlighting announces itself by beaming in from each corner. In other respects, though, the Sony has quite a lot to recommend it. Pictures from a Blu-ray of Sucker Punch are bright and nicely lit, with great energy to the colour palette and very acceptable contrasts. Detail levels are high in all but the darkest tones, too. Broadly speaking, this all applies to the pictures delivered by the Sony’s Freeview HD tuner: it’s crisp and (generally) detailed, to the point that it does Andrew Marr no favours at all. Again, though, a lack of outright detail in blacks is frustrating. It can be a little fussy with motion, too, allowing edges to crawl and shimmer under really testing conditions. The high-contrast vibrancy of upscaled DVD pictures is tempered by their rather soft overall presentation, with approximate edge definition and the previous lack of dark-scene detail extended to a general shortage of fine detail. Movement, again, is a high-risk affair, the CX523 only too willing to give up its grip when the going gets tricky. Throughout, the Sony sounds on the inoffensive side of bland, which for a flatscreen of any configuration has to be counted as a positive. But our overriding impression of the KDL-40CX523 is of a three-year-old chassis crammed with the best of 2011’s budget-end specification and then rather left to get on with it.